We have to replace DLLs with different versions which can potentially raise hell and may not work well on our different WM versions. Inconsistencies, incompatibilities, etc. It's always one custom taskbar or the other, unless you manually customize, and I always want these icons from A, and those from B! And thus, I have decided such an application must be made. This is however easier said than done, and the primary problem is the best way to go at it and the information we need for it. Some icons are stored in resource DLLs, some are stored in BMPs, one resource DLL overrules the other, one image overrules the other, one package overrides the other. Different versions for different DPI's, etc. What we need, is to figure out a proper system. I have thoughts about this, they are discussed further below. Note that retrieving the right files from the device, patching them, un/resigning, putting them back, etc, is not an issue. 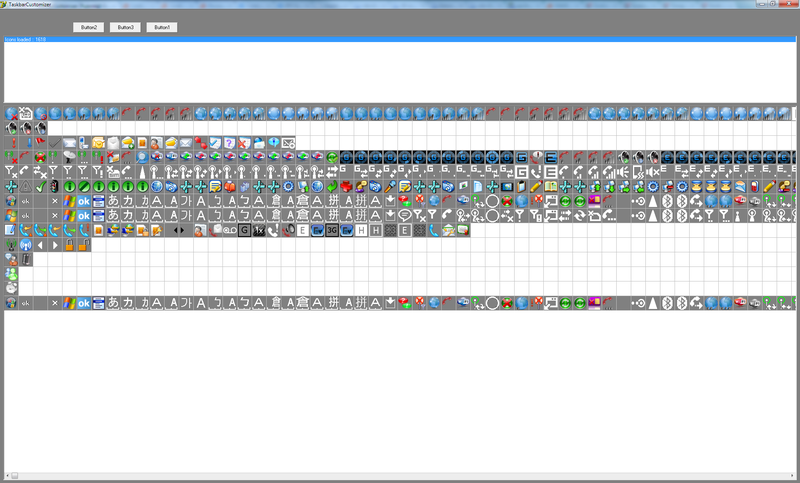 Combinations of my own various tools do all this, and it will all be in Taskbar Customizer when done. ... and many more ... if you have some must-reads to suggest, please post them. This is a full community project. It will never be a commercial thing. Full credit to all people involved. Let's make this **** happen! Gotta say however, that the time I will have to spend on this project will be "hobby". As some of you may know I have many projects here on XDA, and also commercial projects that pay my rent. I will of course try to make the most of it with the time I have. However, a good functional release may be some time away. Right! This is pretty half-assed attempt at structuring my thoughts. First, see this image. I know, it ain't much to look at, what you see in this screenshot is a number of resources from tsowen and co's taskbar v2.1 lite set out against a (smaller) number of original files from the CDMA Rhodium ROM. There are several issues worth pondering. How to divide the icons from eachother. Do we use full "tsowen's Taskbar X" packs and then customize from there, or do we really divide into categories (better, but more work for devs?). For example "johnny's ActiveSync icon pack" and "harry's GSM icons". I would say that if the latter will be done, so should the former (but not the other way around). If we do make 'category packs' and selectors, it will take a lot of work to create these. We would need to very finely define which icon is what in which file. If we do category, there should be careful though and research about which category to make and which icons belong to them. Going through a lot of resource DLLs and the likes, and noticing (among others) tsowen's post about WM6.5 and various posts about different OEM packages, it seems there are many duplicates and overrides. For example, on many HTC WM6 we have phcanoverbmp, which contains a lot of HTC customized images which override the shellres images. However in WM6.5 it seems shellres is used as primary again. How can we best solve this? From what I have looked at myself, one could directly translate between various shellres icon id's and phcanoverbmp icon id's (this is true for multiple packages/resource DLLs IMHO). As example (these are fictional), shellres:1-10 may correspond to phcanoverbmp:41-50. So I think we should 'alias' them. If shellres:1 is changed, than we also change phcanoverbmp:41 (of course, assuming this file exists). I think that we should use shellres as base in this case. Then ofcourse there is also direct file alias. Some ROMs have shellres, others have shellres.dll.<language-id>.mui. These should be defined as 'alias' also, and the application should look for whatever is actually on the device and patch that. Now again is the question, how exactly do we do this? Would it be better to create a different 'name' for every icon? For example, wifi_on_no_network=shellres:20=phcanoverbmp:97, or could we better do phcanoverbmp:97=shellres:20 ? I personally think the former, but it will be more research and more work (but hopefully other people will help). Some of these 'alias' will also include copying BMP or PNG files (like bluetooth icons). Another point of thought is battery. Different packs have a different number of battery icons and require different drivers to be compatible. How do we solve this? However we do the above, IMHO there should be a function to save your creation based on other people's 'packs' and/or your own custom icons so these can be posted on XDA (or geeks, or wherever) and then opened by Taskbar Customizer again so it will modify your device with this pack. The 'save' would then include the required data and icons and the 'load' would retrieve relevant files from your device, patch them, and put them back. As obviously most of the customizers will release their packs to the world, royalties and such would be nonsense. However, I do think every pack should have a 'copyright' notice, and when you 'apply' your combinations of packs (or 'load' this from a pack somebody distributed) you should see a notice containing the names (and optionally donation links?) of all the people who contributed images and the final 'author' of the pack. If all the original packs for Taskbar Customizer just contain a simply one-liner about who made the icons, this can be automated. It goes without saying that any file and registry changes by the app should be backed up and able to be restored. Please discuss and suggest about the above! But if you post please clearly describe what you are talking about, posting that you agree with my or somebody else's thoughts about it are also good, because this shows which idea has the best following. Offering detailed specifics is always welcome. Reporting for duty! Okay I am in guys as well and will try to drag my bro 12aon as well, also maybe see if Crazylilboy, Darklord69, bilbobrian and FInixNOver just to name a few if they might want to help. Also I have a sperate Wm 6.5 taskbar thread as well http://forum.ppcgeeks.com/showthread.php?t=65911 for the one here I just combined the two and call them the collection which you have linked. As I see it the process might be challenging due to ROM differences. Right now I find that WM 6.5 is be cooked many different ways and this is what is causing many conflicts with some of the custom icons. Edit: Forgot my main guys from ppcgeeks Brock and gadgetfreak. I invited them, both have mad taskbar skills. I could never turn down a good challenge. Fair warning, while I can blast my way through a dll, It's been a long, long time since I have done any coding, and that was Unix based GIS stuff. So with my backside sore from Tsowen's not so subtle kick in the pants to head over here, cound me in too! Perhaps we should start with creating a breakdown of exactly which icon is what, so we can match the various locations they may be up with eachother? Also what are the exact differences between GSM and CDMA? So far as I see now that instead of phcanoverbmp cdma_rssi_ppc is used for connection icons... and in WM6.5 both go back to shellres again? (edit) Also, where are the signal bars in GSM ?